Positive affect (PA) is associated with better health across a wide range of physical health outcomes. This webinar will discuss why the study of PA is an essential component of our understanding of physical health and the pathways that connect feelings of happiness to health. We’ll explore important issues to consider when deciding which measures to use when studying this topic and design concerns when researching it. Dr. Pressman will review plausible biological, social, and behavioral pathways that might allow for positive feelings to “get under the skin” and influence physical wellness in the context of several theoretical models. Finally, we will explore new directions for the field and important methodological and interpretative considerations that are essential to moving this important research area forward, especially in the context of positive psychology interventions. The webinar will be followed by a Q&A session at a later date, and we welcome you to join in. 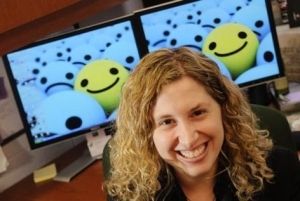 Dr. Sarah Pressman is an Associate Professor of Psychology and Social Behavior at the University of California, Irvine. Dr. Pressman’s work examines how positive emotions are beneficial for physical health and the pathways by which positive psychosocial factors “get under the skin” to influence biology. She is especially interested in the role of positive psychosocial factors in protecting individuals from the harmful effects of stress and whether specific emotions confer resilience in the face of adversity. Dr. Pressman’s research findings have been published in top psychology journals and featured in media outlets like the New York Times, the Wall Street Journal, and the Colbert Report. Click here to see Dr. Pressman’s Tedx Talk on Why Doctors Should Care about Happiness. Click here to read more on Dr. Pressman’s recent work. The Health and Wellness Division’s Webinar Series is a members-only program that features virtual presentations, followed by live audience Q&A with leading researchers and practitioners in the field of positive psychology. IPPA members register to attend these free presentations and enjoy unlimited access to more than 45 past webinar recordings in an online archive.